Hang 10 is a 10 bedroom 6 bath, 1 half bath beach home that sleeps up to 28 and has a private plunge pool. Hang 10 is second tier but has a fantastic view of the Gulf and beach from the porches. Being located only one lot from the boardwalk to the white, sandy beaches, with no roads to cross, it is a very short walk to the beach! This home is as good as Gulf Front, without the price tag! 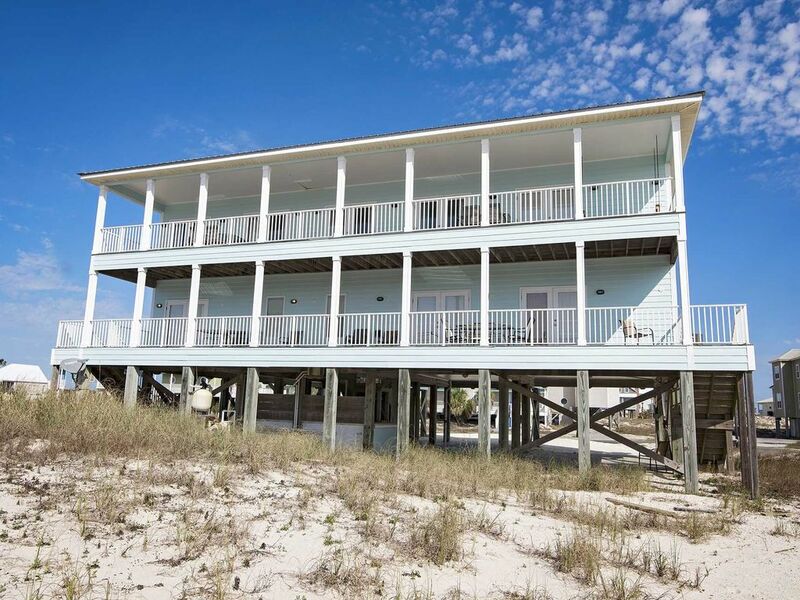 This Gulf Shores/Fort Morgan beach house also has a private heated plunge pool, along with a community pool just across the neighborhood street. Hang 10 beach house was heavily remodeled recently and is tiled throughout, has custom cabinetry, Jenn-Air appliances, granite counter tops, and much more! With 10 bedrooms it is perfect for large groups and is pet friendly so your pup can enjoy a vacation with you! Hang 10 has 2 floors of living area. The first floor has 8 bedrooms and 4 full bathrooms (all bathrooms are shower/tub combos). 4 of the bedrooms on this level have access to the first floor balcony. The two separate laundry areas are also on this floor. The second level of Hang 10 is the main floor and has a large, open living room. The kitchen overlooks the living room area and has 2 stoves, 2 dishwashers, 2 sinks, and 2 refrigerators. The dining area is right off of the kitchen and has seating for 14 at the custom dining table with an additional 4 bar seats at the kitchen counter. There are 2 master bedrooms on this floor, each with its own master bathroom, including both a tub and walk-in shower. There is one half bath as well off of the living room area. One of the bedrooms and the large living room have balcony access to the second floor balcony. Both balconies have lots of seating but the second floor balcony also has a hanging daybed. There are two sleeper sofas in the living room area capable of sleeping 4 more for a total of 28! The exterior is fabulous, the inside is PHENOMENAL! Such a nice surprise! We brought our church youth group here for the weekend and it exceeded all of our expectations. There wasn't one thing I wish we'd had that we didn't. The kids were in awe and it legit slept 28 people comfortably. We would love to return one day! What a blessing! Thank you! Loved the house and location. Had a wonderful Christmas week. Clean, comfortable and it had everything we needed. Shortly after our stay I sent an email listing things that I thought you should know (ie. only one of the vacuums worked, mildew in some of the bathrooms, etc.). Small things that didn't affect our family time but would make it a little nicer for the next renters. The overall cleanliness and operation of the A.C. are the only things that kept us from putting a 5 star review of the house. The location is easy to find. The house is situated far enough from the beach that the noise from beach-goers won't bother you, but still just a short walk down the path and straight onto the beautiful beach. Even with it being "dog friendly", we found no issues or evidence of any animals in the house. There was however, sand EVERYWHERE.......after all, it IS a beach house!! There were some places in the house that could use a deep cleaning (stains on walls, bathroom grime buildup, etc), but nothing at an unacceptable level. Some of the furniture was slightly broken, but all of it was still in working order. The biggest issue we found from the whole trip was that one side of the house never had working air conditioning. Being there in November, this wasn't too much of a problem for us though. We used Hang 10 for a business work retreat and overall, everyone loved the experience. We would defiantly consider Hang 10 for our next trip to Alabama. It is perfect for a large group! We had a very enjoyable stay here. Although there were a lot of people in the house we never felt crowded. Being allowed to bring pets was a huge plus too. It amplified the enjoyment of the vacation to a new level. The giant table in the dining area was great for gathering in the morning before everyone went off to enjoy the beach and town, and in the evenings when everyone got back. Extremely convenient to the beach. Great home. Lots of fun! Great place with lots of room! We loved staying at Hang Ten! We have been coming to the Gulf Coast for 32 years with our ever growing family, and for once, had plenty of room. Thanks so much!